I found this recipe in a magazine a week or so ago. I wrote down what I needed and then lost the magazine. I likely put it in the recycle bin but it means that I cannot give credit where credit is due. The original recipe called for ground beef, but seeing as how cows and KK don't get along well, I used my old standby of ground turkey instead. * Brown meat in pan on stove top. I added in onion powder, salt and pepper to taste but you can do whatever makes you smile. Drain liquid from meat. * Place meat on the bottom of your largest pie pan. A tiny pie pan will not do- this is a lot to go into one pan! * Next layer on the bag of broccoli and spinach. Then add the cheese layer. Then the sauce on top of that. Then the pie crust. 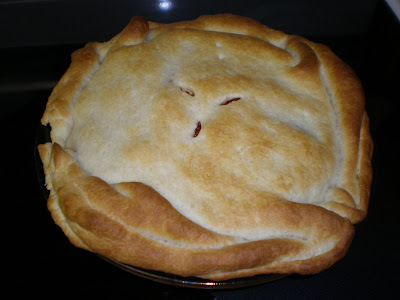 * Slice three air vents in top of pie crust with sharp knife or kitchen scissors. * Place in pre-heated oven (check directions on can of dough but I believe it was 375 or 400) until golden brown on top (about 20-30 mins). This is a super simple, all in one meal! 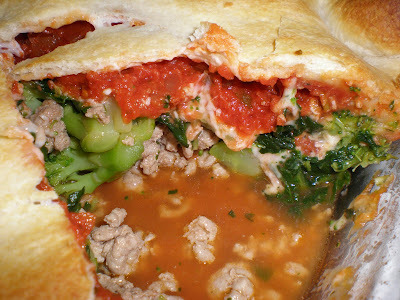 Very delish and heats up well the next day as lunch! that look delicious! I need to put that in the rotation! this sounds somewhat like the meatball pie that I made once, to use up some meatballs that were leftover from a party...I made it up as I went along and it was very good! You do not have to post this, but I could not find an email. I am a single mom, adopting my second daughter....and saw your post on Linny's blog and wanted to encourage you. God will lead you on in the passion in your heart. Singlehood is not something to be shamed or feel like it leaves you undeserving....God has allowed, led you to this point in your life...so there is nothing about it that is less. Perhaps consider fost-adopt programs. In our state, the cost of adopting a child that is in the foster program is less than $1000 and you get a stipend for them until they reach 18. I was in the fost-adopt program for a year. I later adopted from China and am now adopting from Ethiopia. But if I adopted a third time, I would go back and look at the fost-adopt program for my state. There are thousands of children in need of loving mommy's and it is not cost prohibitive. I am so making this...Thanks! Looks good...I'll have to give it a shot! Maybe this week! Amazingly we made this once - even more amazing? It came out really good! Have a delightful week Miss PPC! seriously- this looks amazing! I might magically appear outside of your house with an empty plate in my hand and some sad orphan eyes just begging for a slice!